The Criterion Collection released a Blu-Ray version which claims to contain, among other extras, the complete "cleaned-up" television version of the film, prepared by Cox. It was released in April, 2013. American Laundromat Records released a Repo Man Soundtrack tribute CD in September, 2012. View the results of the Repo Man Poll which lasted for over 10 years with more than 1500 responses! Repo Man was voted by me to be the best movie of the 1980s. This web site attempts to reference all sources of Repo Man information located anywhere on the internet. If you know of any I'm missing, please give me feedback. Director Alex Cox's web site - with a great interview about the movie and other cool stuff. 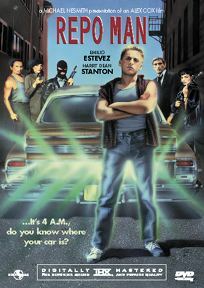 Repomanfilm.com - Trent Reeve's homage site, with the world's largest collection of Repo Man memorabilia. Detailed transcript - comes complete with notes on trivia, goofs, the tv version and the original screenplay (for other scripts, check out Simply Scripts). Filming locations map Sounds from the movie here. Content of the soundtrack CD. The Making of Repo Man. Miguel Sandoval talks about getting the role of Archie. Alex Cox's first sequel to Repo Man. In 2005, AntStuie Productions began filming this as a no-budget production, but it was never released. They did, however, eventually produce a documentary about the experience called A Texas Tale of Treason, which may still be available on eBay. More information here. A short time later, work began on the Graphic Novel which was advertised as the official sequel and released in the spring of 2008. It appears to have been influenced by a rough cut of the unreleased film. I once had my own idea for a sequel, but it was completely different and nobody has shown any interest in filming it yet. See also information from the faq. Stuck in the 80s Repo Man podcast in which 2 aging stoners reminisce. The Repo Man Road Rally. The Repo Man drinking game. A Repo Man page in Japanese. Alex Cox's second sequel to Repo Man. Alex Cox wrotes about the filming of this in his blog, starting with the January 27, 2009 entry, but it appears to have since been removed. Maybe you can find it in an internet archive somewhere. Behind the scenes of the visual effects mini-documentary. Alex Cox films a scale model train: here and here. Other interviews and clips available on YouTube, just search for "Repo Chick". Reviews here and here and my own IMDB review. Links too numerous to mention have variations on 50 ways to confuse your roommate all of which contain as item 14: Recite entire movie scripts (e.g. "The Road Warrior", "Repo Man", Casablanca") almost inaudibly. Is Repo Man a punk film? Why Repo Man is one of the 25 Good Things About the 80s. Some favorite quotes from Atlyrics, The Movie Quotes site, and Wikiquote. Alex Cox discusses the cars used in the film. Tropes used in the movie. There used to be a good on-line explanation of why Pulp Fiction=Repo Man, except made for white college kids to like. It has been suggested that it was the aliens from Repo Man in the briefcase (which in turn may be the unexplained nuclear device from "Kiss Me Deadly"). The Ain't it Cool News Rolling Roadshow runs into a Repo Man Reunion. A flyer for the book Clear Intent, just like the one which Lagarto is carrying while driving the Malibu. Why driving makes you stupid. Videoranch - the ancestral and artistic home of producer Michael Nesmith. Discography of the Plugz and a Portrait of the band. The following web sites should be commended for having a link to this web site! Question, comments, suggestions? Submit your feedback here.